I can honestly say the last few weeks have been totally bizarre for food and drink. I’ve eaten more chocolate than is probably recommended for one human being and I’ve lived off sugary drinks – bouncing from one sugar high to the next. I like to blame my deadlines (I’ve had four recently and the last is on Monday) but ironically one of them was on what causes high blood pressure and the other was the role of fats in the body (and which to avoid) so you would think I really would know better! I’ve been getting so tired in the afternoons that naps are becoming a regular occurrence and I think it’s probably a self induced sugar slump. So for the last few days I’ve been trying to eat more fruits and vegetables again to try and bring my body back to balance! I’m pretty sure any kind of stress makes the body want to reach for fat-rich, sugary processed foods and my body is no exception. I was not going to let myself go to McDonalds. Not when I’ve been doing so well! So I decided to make my own! They were so simple and although they took a while to put together they came out perfect and because they were baked in the oven they were much better for me too. 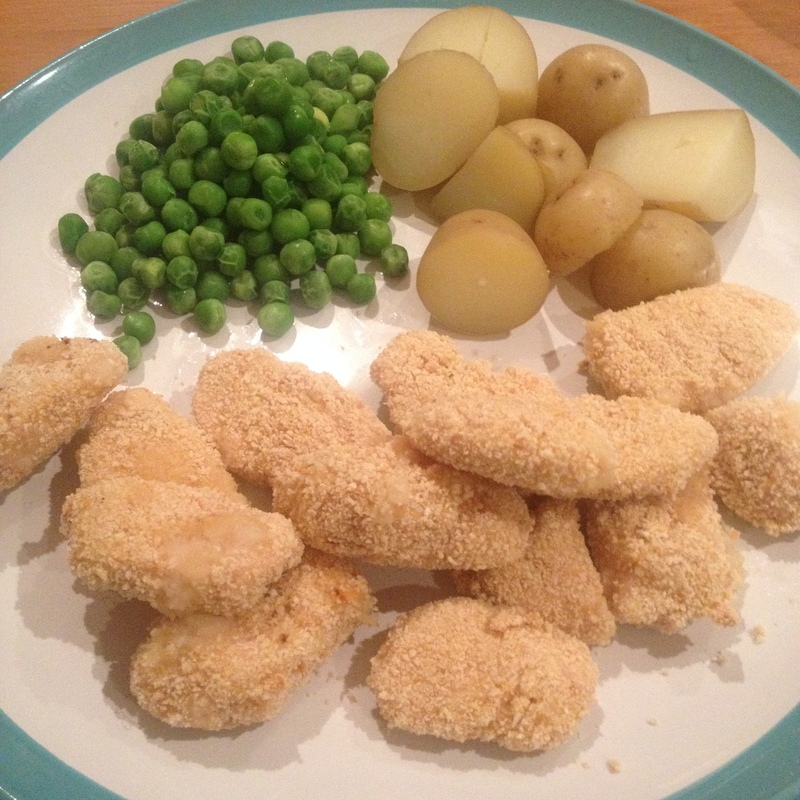 All you need is a generous tablespoon of plain flour, a beaten egg, a pile of breadcrumbs (you can make your own – but I am totally inept at making them myself so I bought them in a tub…) and your chicken. I used 2 chicken breasts and it made so many and filled up the whole tray! 1) Take the piece of chicken and drop it in the flour. Make sure it’s fully coated and shake of the excess. 2) Drop it in the beaten egg. Turn it over in the egg a couple of times so it’s fully covered. Then lift out with a fork. 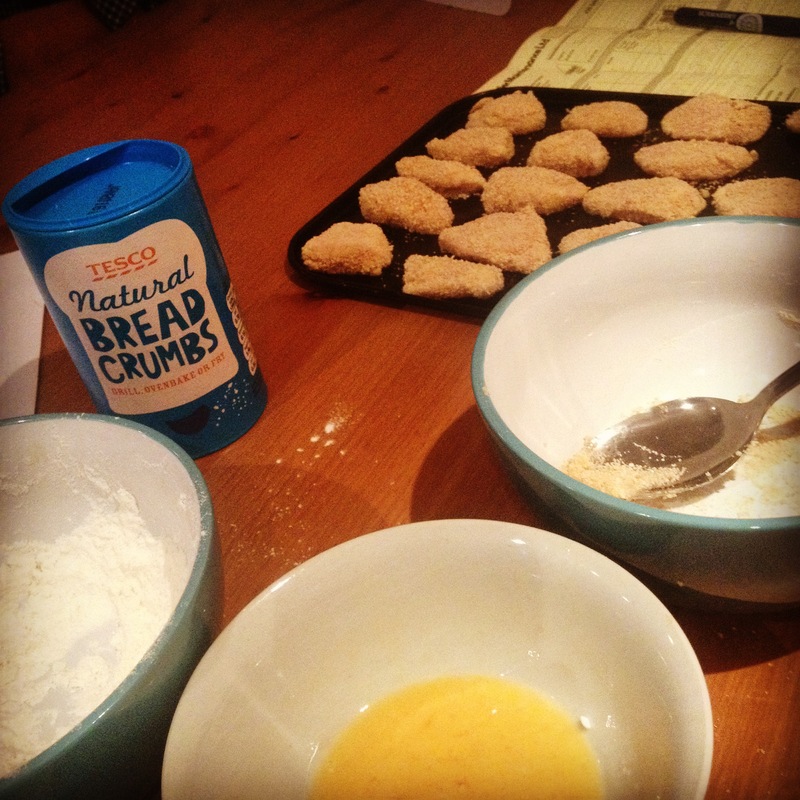 3) Place the eggy-floury-chicken into the breadcrumbs and make sure it’s fully covered. Sometimes it might be helpful to push the breadcrumbs into the chicken a little bit to make sure they stick properly. 4) Place on a baking tray and cook in the oven at 180 degrees Celsius for twenty minutes or until cooked through.